The biggest fleet to take the best of the city sunset and the city lightning. Adapted to the light of the moment so that you always get sunset on the place that will make you always remember Madrid. Yessss! 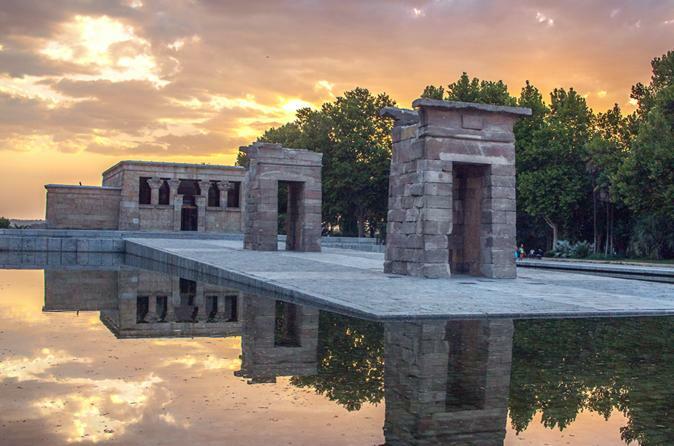 One of the landmarks is an Egyptian Temple in Madrid, when the Aswan dam was built the Government of Egypt gave it as a present to our country. Get the best views in the best moment of the day, the Royal Palace, the Cathedral… or let us surprise you, you will not regret it! Best place on the best moment. Get to know the different skylines of Madrid, or our romantic places by the ponds in Casa de Campo or Retiro, depending on the season, the weather and or the guide! Each guide has it's own tricks and tips. In Summer we chase the cool and in winter the building lights or Christmas lights... so if you happen to say: "I already know that tour!" you will only have seen one of the city sunset chapters.